Contributing to the development of a citizen-centric Internet of things. Click the thumbnail for a PDF of some of our champion statements prepared for the Web Science Trust presentation 9th February 2015 (available to watch here). Or read all current champion statements in full below. We’re all human. We’re also all now on one worldwide network, and we need to keep that human too. Nothing is more human than our differences — not only from each other, but from our former selves, even from moment to moment and context to context. Likewise, nothing is more human than our ability to relate to one another in countless ways, all the time, even as we all grow and change. Our new networked world needs to respect that. The hi:project is a great way to help make that so. The next challenge for human organizations is to leverage ever more intelligent machines while enhancing human dignity and relationships. The hi:project steps up to this challenge with bravado and a refreshingly smart approach. Moving control of how users interact with information away from intermediaries is inevitable and the hi:project represents the next evolutionary step on this journey. This novel approach is refreshing, empowering and completely necessary. The hi:project may very well become the epitome of Vendor Relationship Management for individuals. You will choose and control who you are online. It will offer a direct one-to-one way of interacting with products, services, brands and companies that say they care about “you” but really don’t. This may very well make them sit up and take notice. SOCIOTAL is keen to work with the hi:project towards a citizen-centric Internet of Things. As someone who has been in this space for a very long time and as someone who has tried to solve for this problem – I cannot stress enough how important the hi:project is. The approach is not only novel but well thought through and presents an incredible opportunity to get individual privacy on the Internet right. The hi:project sets out a path leading to interfaces that fit each of us, respond to each of us, grow and change with each of us. The interface working with different systems, helping us interact the way we want to interact. It’s the difference between off-the-peg and bespoke tailoring, but in the digital world. Individual interfaces for individuals. There is an urgent need to find new innovative solutions to strengthen trust and inclusion in the digital economy. The hi:project has the potential to achieve both and could not be more relevant to the needs of business, government and citizens. The world has been waiting for the computer interface to become a human interface. Context is king. There is data, data everywhere but no way to understand it all – until now. The hi:project has the potential to solve that evergreen challenge to create a seamless experience so we can become one with the information we seek to understand. We are on the cusp of an exciting wave of practical decentralisation of data and the experiences that being it to life, and this means control of the interface is moving away from organisations and towards the individual. The hi:project is a visionary and delightfully ambitious attempt to accelerate this and give us all more control over our living data, so we support it and hope it succeeds. The hi:project has definitely set its sights high. Redefining – and making meaningful – some of the most used and abused terms in this space such as ‘personalisation’ and ‘user interface’ is a tall order. The focus on empowering the individual, decentralisation and openness gives me hope that the hi:project will go some way towards redressing the current imbalance of power between individuals and organisations. And as a result benefit both. Technology developments over the past decade have had a consumer focus vs. a human focus. Specifically when it comes to data, large tech firms and social platforms are controlling and monitoring human data without much care or transparency. It is time to empower the human in the modern digital world. This will not only shift the power back to the rightful owner (the human) but enable better experiences all round. 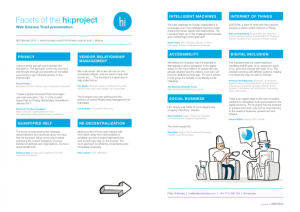 The hi:project is finally a step towards recognizing people for who they are, human beings – not segments, targets, demographics, potential customers, lookalikes or other awkward assumptions. Here at 3beards, we’re always looking out for the next big thing in tech. We believe personal data and quantified self are the next logical evolutionary steps impacting the way we live our lives, so we’re very excited to see what happens with the hi:project! As a long time advocate of social media, to me the hi:project presents a logical next step for managing personal data. I trust the founding team to architect and deliver such a concept, so I’m a supporter, a fan and a co-promoter. I love the idea of a kind of responsive design approach which goes way beyond sensing device and screen size to the context and requirements of the “soft machine” that we are. I also believe in the fundamental interconnectedness of all things, so this kind of holistic approach makes perfect sense. This is an ambitious open source project aiming high with a purpose, and we’re delighted to be supporting it. In a future where the economy is going to be data driven, privacy and security have a key role to play. The hi:project is a great example of a distributed yet disruptive attempt to bypass the information gateway keepers, while respecting security and privacy.